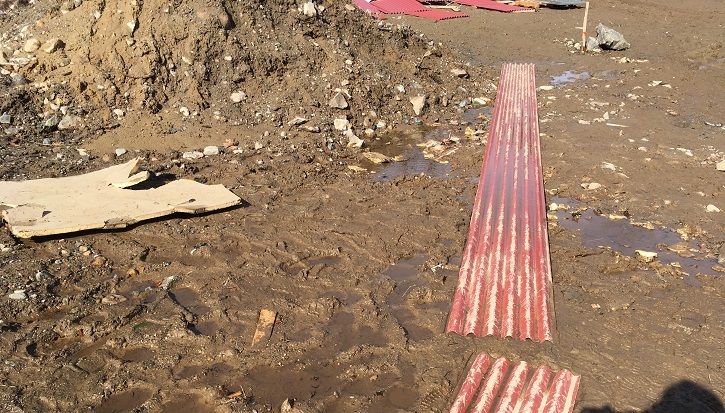 Posted on March 12, 2018 by Kelly M.
February has brought more progress to the Environmental Learning Center job site, which has been humming with activity amid the storms and gray skies of winter. With just about three months to go until the grand opening, there is lots happening both inside and out. 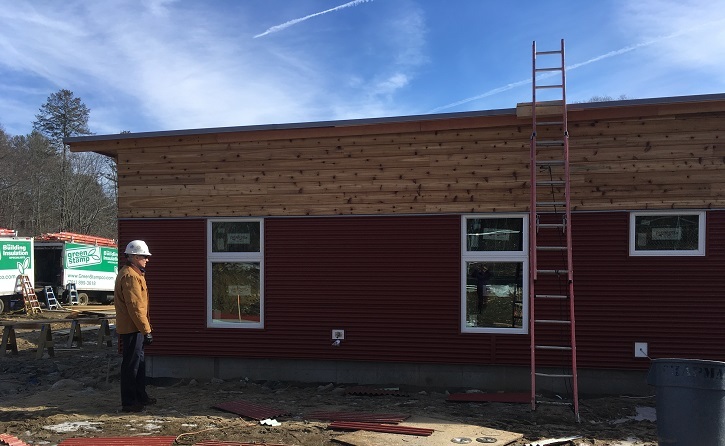 The most noticeable progress has been on the outside of the building, with the installation of a beautiful combination of cedar and aluminum siding. Our staff loves the “rustic red” color against the beauty of the wood. The Chapman Construction/Design crew had some natural challenges to face when we went through a thaw. Got to admire their creativity in finding pathways across the mud! Indoors, the major milestone of the month was the completion of the insulation. 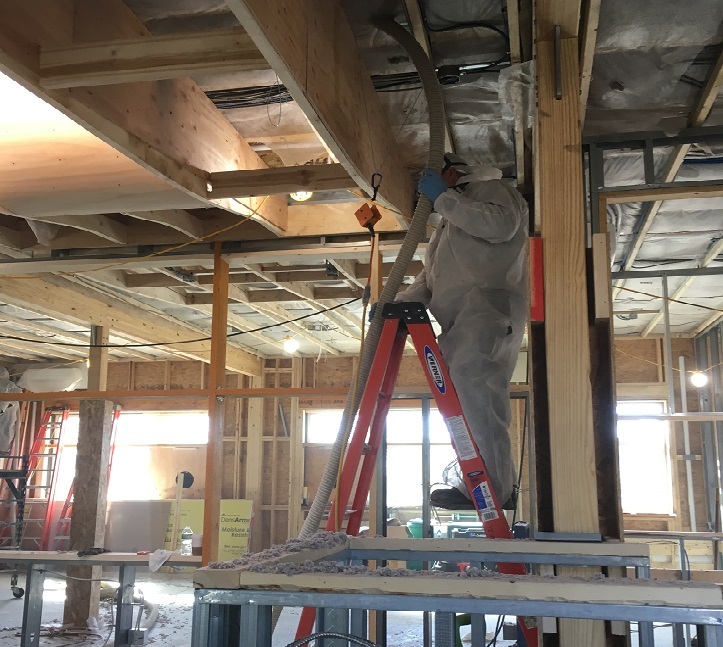 In addition to all the rigid foam that lines the walls, ceiling, and foundation, pounds and pounds of cellulose insulation (made from recycled newspaper) was blown into the ceiling and wall cavities. It took about a week to get all the gaps filled up, but now we’re confident that this building will be our most energy efficient ever! …then you pat the walls or ceilings to judge whether they match the box. It may seem like an inexact science, but apparently our sense of touch is good enough to be fairly accurate in this case! 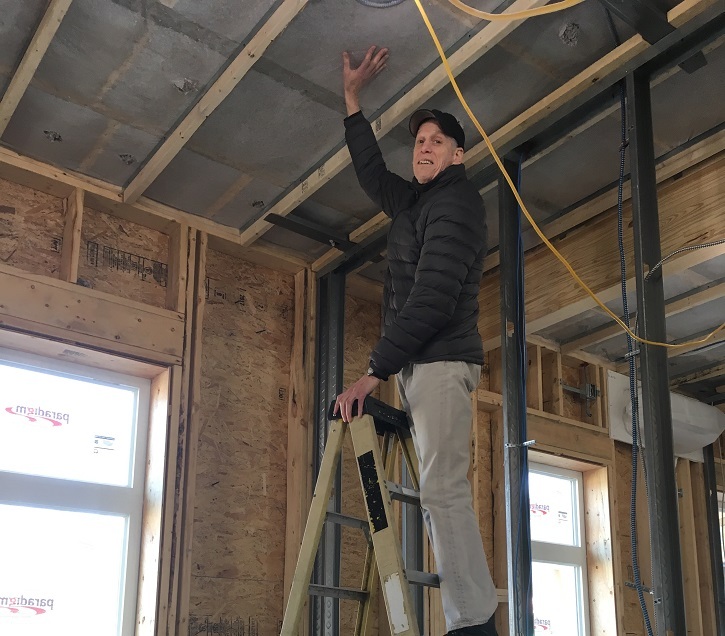 Mass Audubon’s Capital Projects Manager Stu thinks they got it just right. Once the insulation was complete, it is time for the walls. 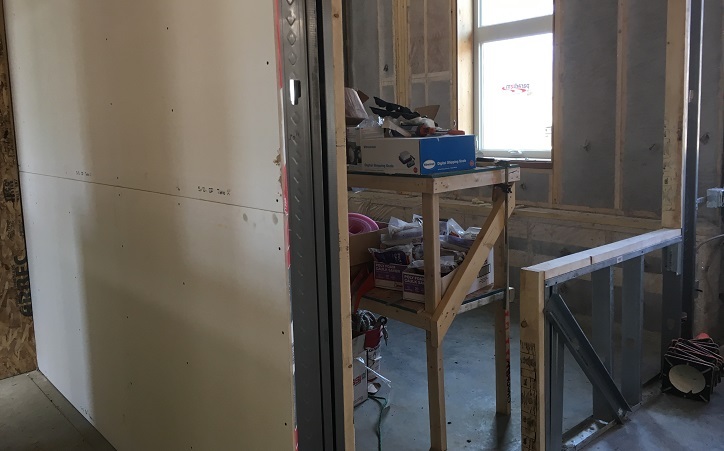 Sheetrock is starting to appear along the hallways and rooms, further defining the spaces where so much great educational ideas will take shape. 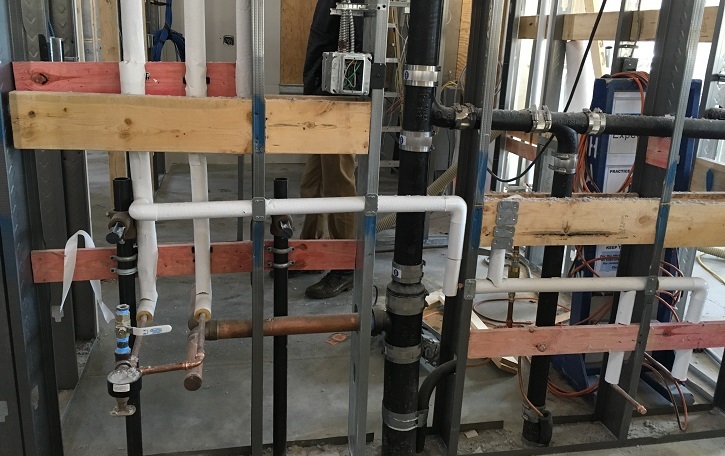 In parallel, the behind-the-scenes plumbing and electrical work has been finishing up, ready to be walled in but still appreciated for its tidy and functional construction. 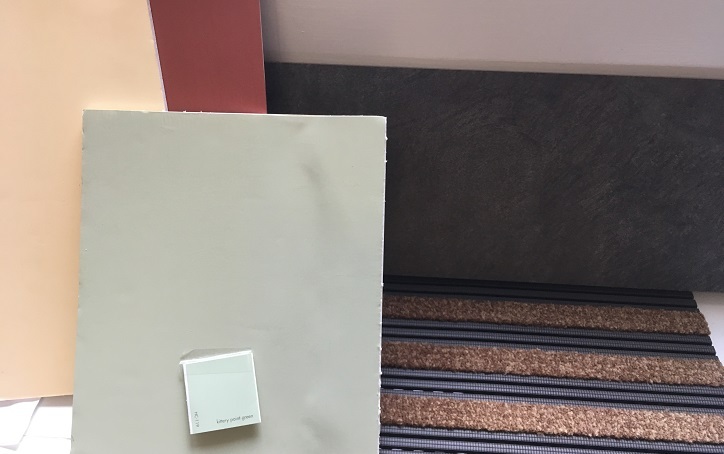 Finally, our design team has been busy making decisions on a weekly basis on the colors, textures, and finishes that will give the space the right ambiance. We’ve settled on a very natural color palette that reflects both the landscape of Drumlin Farm and our farm-y roots, with some practical aspects like an entrance mat that kind of matches the dirt that we know will be on our boots from our time in the pastures and fields. Look for more updates coming soon. If you would like to learn more about the project, or get involved yourself, we invite you to learn more at massaudubon.org/environmental-learning-center. 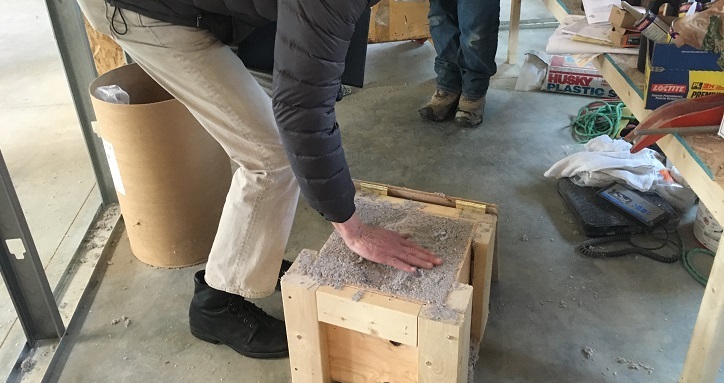 This entry was posted in Education, News and tagged building, construction, education, ELC, green building, landscapes for learning, sustainable building on March 12, 2018 by Kelly M.. When Polly Reeve was growing up in New York City, she never pictured rolling pastures, goats, and chickens would be part of her daily job. Yet, that’s exactly what happened when the big-city native became passionate about conservation. After studying history and literature at Harvard University, Polly began a career in nonprofit resource development, eventually working at the Trust for Public Land. It was there that her interest in the connections between open space and people blossomed. Years later, after receiving additional training at Harvard’s Landscape Institute, she began managing her own landscape design business. Yet, something was missing; she yearned to once again be part of a mission-driven organization. 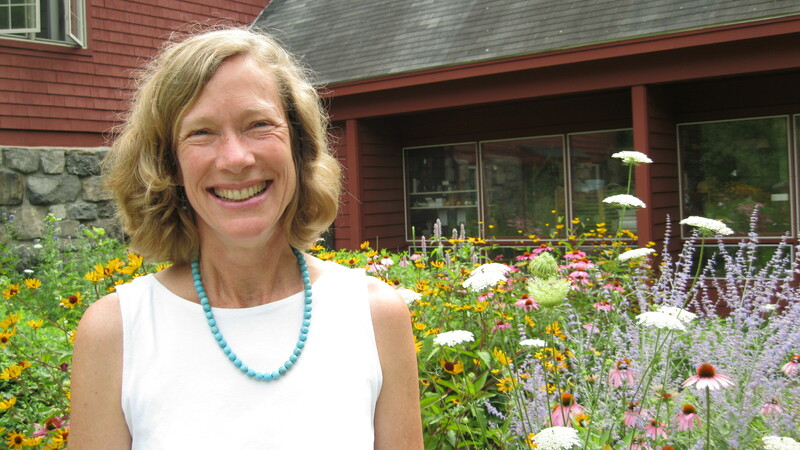 This longing led her to the The Food Project, where she served as development director for five years prior to joining Drumlin Farm in March 2015. As development director at Drumlin Farm, Polly enjoys communicating the breadth of the sanctuary’s “amazing work” as well as the impact of that work within the community. Most of her time is devoted to cultivating Drumlin’s $4.7 million capital campaign, Landscapes for Learning, which will provide critical support and infrastructure improvements that enable Drumlin to bring meaningful programming to the public. At present, Polly has her sights set on Moon Over Drumlin, the sanctuary’s biggest annual fundraiser. Set for Saturday, September 26, the gala and auction will raise funds that support education at the sanctuary and within the community. This year’s event promises to be bigger than ever, with six expert chefs from Cambridge, Somerville, and Concord; delicious tastings prepared with fresh Drumlin Farm ingredients; a live auction; and a raffle. Along with lifelong farmers and educators, Drumlin Farm’s staff includes a variety transplants from other career paths, including engineering, veterinary medicine, music, sales, entrepreneurial ventures—even podiatry! Our “Meet the Staff” series explores the many ways that the people who work at Drumlin Farm found themselves drawn to common goals of environmental education, sustainable farming, and conservation. This entry was posted in Events and tagged development, fundraising, landscapes for learning, moon over drumlin, staff on July 30, 2015 by Heather.